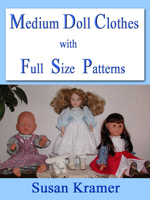 Here are instructions for making a one piece bodysuit to fit 11 to 13inch (28.5 to 32.5cm) Gotz Muffin, Corolle Calin and small baby dolls with similar body types. 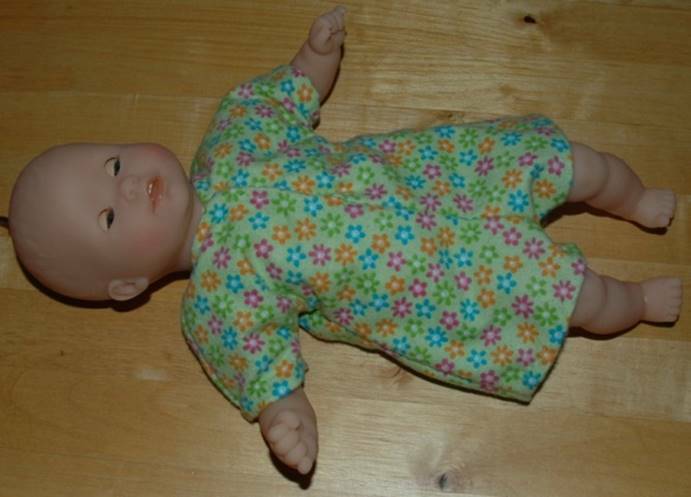 It is for boy or girl small baby dolls. 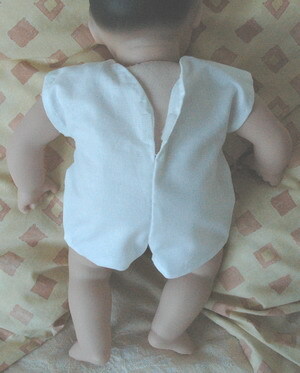 The bodysuit can be used as underwear to keep the doll's cloth skin clean as it just cover the cloth parts of the doll. 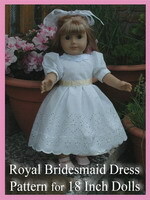 Also it can be made up in print or flowered fabric as light weight summer wear outdoors. You’ll need one quarter yard (one quarter meter) of material. Two sticky dots for front shirt and back shirt closing, (no buttons for kids doll clothes, please). 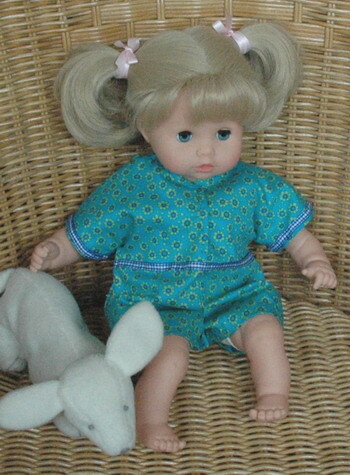 Photo above is Corolle Calin with one half inch side seams. Photo below is Gotz Muffin with one quarter inch side seams. 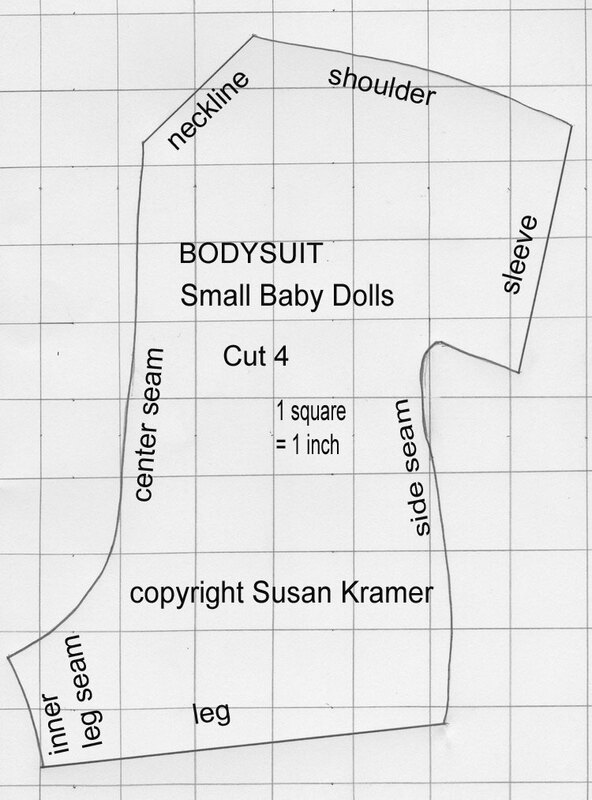 This is a very easy to make bodysuit pattern with just 1 piece. 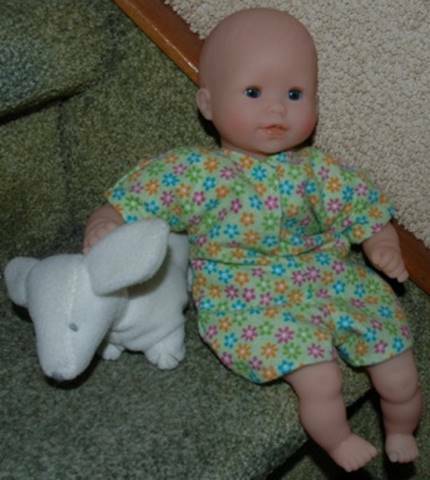 The pattern piece is below. Cut 4 pieces of the pattern. 2 for front and 2 for back. 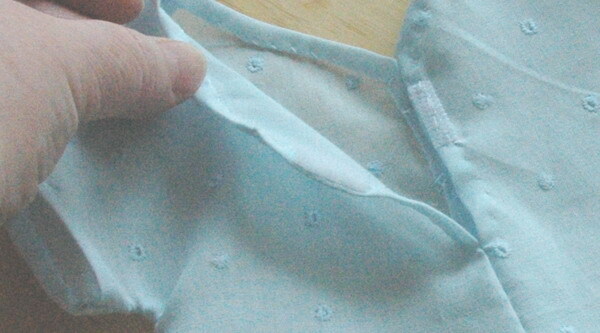 Sew center front seams together beginning 2 inches below bottom tip of diagonal neckline; see sticky closure. Sew center back seams together beginning 2 inches below bottom tip of diagonal neckline. 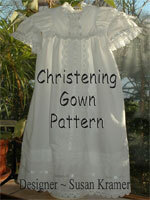 Place good side of front and back toward each other and sew underarms all the way to bottom hem on both sides. Sew front to back at shoulders. 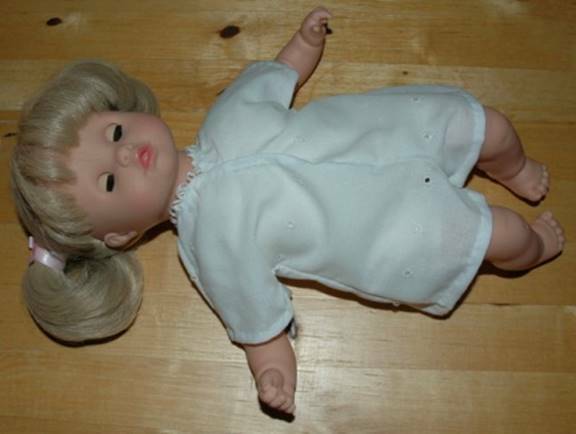 For all hems roll edges in 1/8 inch twice and blind seam: Lower legs, lower sleeves and all the way around front center up to neck, around neck, down to back center, up to neck around to front and back to starting place. To finish sew a sticky dot on center of front and back opening. Having openings in front and back makes the body suit easy to put on and take off. The pattern is traced onto 1 inch (2.5cm) squares of graph paper. 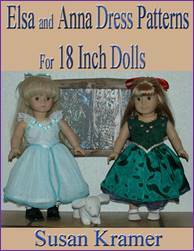 Pattern piece includes 1/4 inch seam allowance unless noted differently. 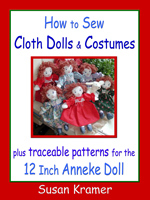 These pattern is my copyright but you may use it for personal use and gifts but not commercially. The pattern is traced onto 1 inch (2.5cm) squares of graph paper. 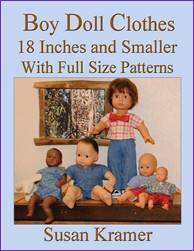 If you would rather have a full size pattern buy my PDF ebook that includes this and many more patterns: Boy Doll Clothes, 18 Inches and Smaller with Full Size Patterns. This pattern is my copyright but you may use it for personal use and gifts but not commercially.